San Francisco, CA – May 17, 2018: Executive Director, Dorothy Alther and Legal Fellow, Anna Hohag, attended the annual California Bar Foundation (CBF) Board meeting where they were invited to speak and present to the Board of Directors in San Francisco. At the meeting, it was announced that CBF would be changing their Foundation’s name to “California ChangeLawyers,” to better demonstrate the organization’s commitment to empowering the next generation of lawyers, judges, and activists to create a more diverse legal profession, a fair justice system, and a better California. As California ChangeLawyers provides funding for Anna’s Fellowship at CILS, Dorothy and Anna presented to the Board the work that CILS does throughout California to represent Native Americans, low-income individuals, and people in rural areas of the state. The Board was ecstatic to hear that CILS through the Bishop office is making real change for clients in rural communities who would ordinarily have trouble obtaining legal assistance. Their issues range from improper tax, tribal court development, and Indian wills to special education services and community education. 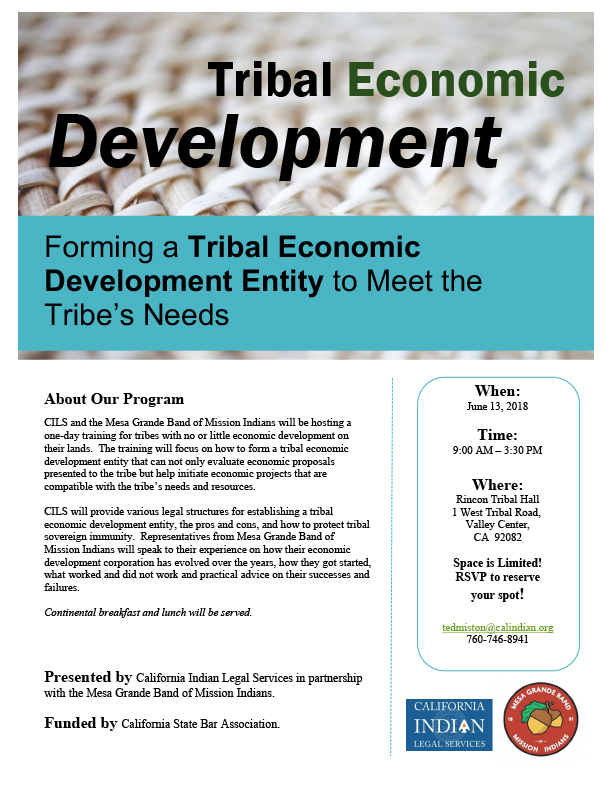 It was clear that CILS, as one of the premier training grounds for attorneys advocating for tribes in California and nationwide, fit perfectly into the vision of California ChangeLawyers, who were happy to see their Fellowship grants used to further their mission. On January 31, 2018, the Second District Court of Appeal issued a ruling which could have had a detrimental state-wide impact on the likelihood of Indian children involved in dependency cases being placed into Indian homes. (In re R.H. (2018) 2018 WL 636192.) CILS, in partnership with the California Tribal Families Coalition, recently succeeded in petitioning the California Supreme Court for depublication of the case, so that it cannot be used as precedent in future cases. If an Indian child is removed from parental custody by a county social services agency, the federal Indian Child Welfare Act, accompanying federal regulations, and California law all require that the county make a “diligent search” for another home which meets the ICWA’s placement preferences. For adoptive placements, if an extended family member is not available, other members of the child’s tribe and other Indian homes are preferred. Such homes provide the child with the best opportunity for a connection to his or her tribal community and a strong cultural identity. The Second District’s decision could have been interpreted to absolve a county from searching for an Indian home if the child’s tribe said that it would search within the tribe. CILS and CTFC contended that, in addition to conflicting with existing law, such a position would be harmful to Indian children whom the ICWA was designed to protect, in that it would almost certainly result in fewer Indian homes outside of a child’s tribe being identified in the future. Fundraising is always a challenge for nonprofit law organizations. That’s why it helps significantly when other legal services organizations share their successful fundraising strategies and help troubleshoot problems. In May, Mark Romero, Chairman of the CILS Board of Trustees and Nicole Scott, CILS Director of Marketing and Development attended training hosted by the American Bar Association Section of Litigation Committee. Taught by two veteran fundraisers, Jack Ward (retired from the Greater Boston Legal Services] and Lisa Verges (Community Legal Services, Inc. in Philadelphia], Mark and Nicole learned many new fundraising ideas specific to legal aid. The training, held at the posh DLA Piper offices in downtown San Diego, also gave CILS the opportunity to mingle with staff and board from a dozen other legal aid organizations from across the country.